The EGLSF would like to say “Djękuję!” to our member club KKS for hosting our AGA on the 7th & 8th of March. 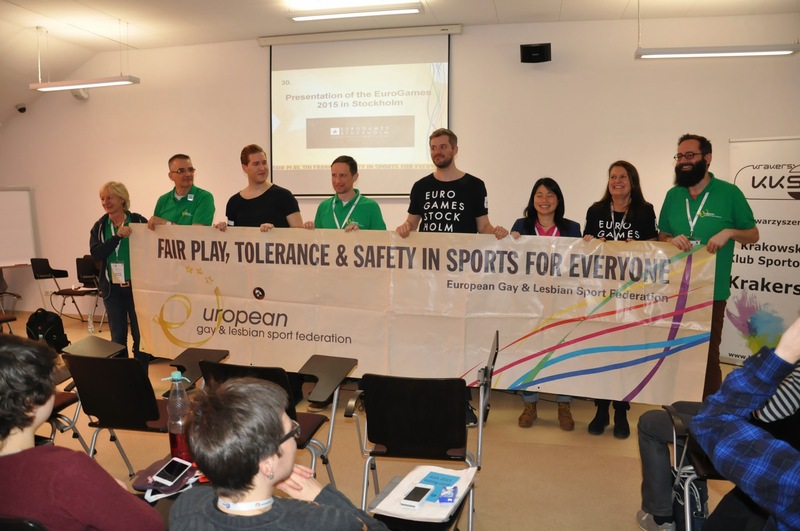 We would also like to congratulate them on the very successful conference on “Gender and Sexual Diversity in Sport” which was held on March 6th. It was a pleasure to be part of the first ever LGBTI sporting event in Poland, and thank you for the great photos. During the two days of the assembly, many topics and motions were discussed and passed. One of these motions, presented by the Diversity Committee, regarded the use of sexual orientations and gender identities instead of previous term gay & lesbian. From 2016, elected board members will stay on board for a three-year period, instead of the current two years. Board members and can be reelected for a maximum of three periods, so no more than 9 years in total. Thanks to the new motions, parts of our Statutes and Bylaws have been modified to keep them current and relevant. The minutes from the AGA are currently being prepared, and we will let you know when they will be available online. The EGLSF strategic plan 2015-2016 was presented to the assembly and was unanimously adopted. The priority is to position the EGLSF as a lead organisation on gender equality in sports. More specific plans are being further developed and we look forward to executing them in the following months. We would like to thank the other candidates who put themselves forward and for offering a choice to the delegates. The federation would also like to thank our former treasure Tim Van Hoydonck (2012-2015) and Dániel Waliduda, board member at large (2013-2015), who have left the board this year. We wish them all the best, and we also hope they will continue their work in LGBTI sports. 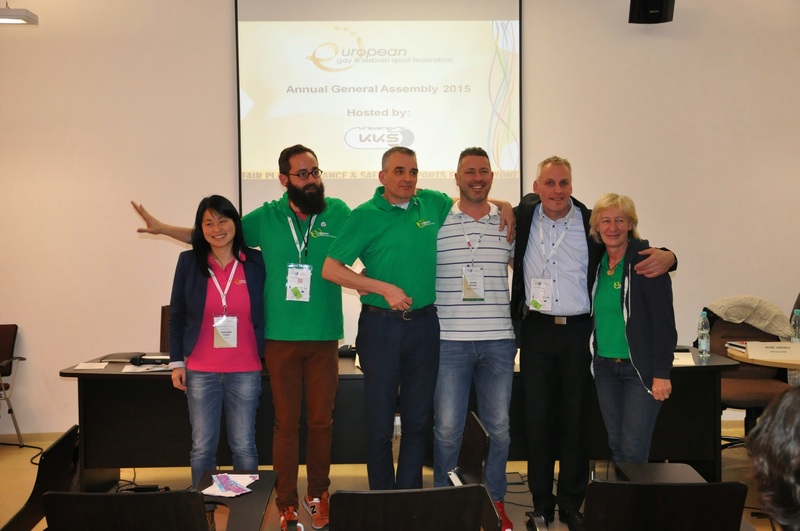 The board would like to welcome its new committee members and we wish the best of luck for the future in their specific roles, and a special mention for the newly approved EuroGames committee. Johan van den Ven (Honorary Member), Lou Manders (John Blankenstein Foundation) and Florian Kloth (Startschuss Hamburg). Liaison Board member: Edwin Westenberg. Conny-Hendrik Kempe-Schälicke (Seitenwechsel), Leviathan Hendricks (FGG), Zeljko Blace ( qSPORT). Liaison Board member: Annette Wachter. Janis Köppel (Seitenwechsel), Patryck Ślediński (Volup). Liaison Board member: Jon Landa. Hans van Dop (EuroGames 2011), Philippe Houtermans (Active Company), Markus Zitlau (Dusseldorf Dolphins), Lou Manders (John Blankenstein Foundation). Liaison Board member: Tamara Tien. EGLSF would like to thank former committee members: Lovro Centrih and Anya Wiersma. Glaschau, Alba! Glasgow, Scotland was elected as the host city for the 2016 AGA. This is a first for Scotland and we would like to offer our congratulations to Hugh Torrance and Katherine Burrows along with the rest of the organising committee. It will be an exciting year ahead for our Scottish friends who have already begun their preparations. Over the coming months we will be updating you with all the information you will need for next year’s AGA. The board also takes this opportunity to thank Brussels Gay Sports for presenting a very informed and passionate host city candidacy. Your hard work and dedication to the EGLSF is greatly appreciated.